Abdellatif, H., and Shiha, G. Liver Regeneration: Summary of Involved Cell Types. (2017) J Stem Cell Regen Biol 3(1): 122- 125. © 2017 Abdellatif, H. This is an Open access article distributed under the terms of Creative Commons Attribution 4.0 International License. The liver has unique capacity to regulate its growth and mass. Healing process in the liver is characterized by the proliferation of all existing cell lines within the liver, including hepatocytes, hepatic progenitor cells, non parenchymal epithelial progenitors and small heptocyte like cells. Normally the liver exhibits a very low level of cell turnover, but when an abnormal hepatocyte loss occurs, a rapid regenerative response is elicited from all of these cell types in the liver. In this article, we review broadly the natural repair of the liver in response to injury. End-stage liver diseases, in particular cirrhotic liver, represent a worldwide health problem. Currently, liver transplantation is the only effective treatment, but it is associated with many problems, as, shortage of donors, operative damage, risk of immune rejection and high costs. Furthermore, liver transplantation may cause considerable long-term side effects, such as chronic renal failure, post-transplantation lympho-proliferative disorders and cardiovascular problems[1,2]. The emerging field of stem cell therapy has raised hope for improving treatment of liver diseases, because it is capable of promoting liver repair and regeneration with fewer complications. Stem cells are capable of self-renewal and can differentiate into specialized cell types. Cheng, (2008) has recently defined five minimal characteristics of stem cells, which includes self-renewal, maturation, resting mode, apoptosis and trafficking. The lack of any of these essential characteristics would make stem cells much less physiological in nature and not suitable for use as therapeutics. Normally the liver has a very low level of cell turnover, but when an abnormal loss of hepatocytes occurs, a rapid regenerative response is elicited from all other cell types in the liver to restore the organ to its original state. More severe forms of liver injury, particularly longstanding iterative injury (example: chronic viral hepatitis) or when replicative senescence is reached (example: steatohepatitis), activates a facultative stem cell compartment that resides within the intrahepatic biliary tree, giving rise to cords of bipotential transit amplifying cells (oval cells in rodents and hepatic progenitor cells in man) that can ultimately differentiate into hepatocytes and biliary epithelial cells. A third population of stem cells with hepatic potential is located in the bone marrow; these stem cells usually make minimal contribution to regeneration but, after fusion with metabolically defective hepatocytes, they can be reprogrammed to contribute in a major way to restoring liver functions. The natural repair of liver is primarily dependent on endogenous stem/ progenitor cell pools (Figure 1), including hepatocytes, HPCs (hepatic progenitor cells) and OCs (oval cells). Under normal conditions, mature hepatocytes are able to maintain their number. However, in persistent chronic liver injury, resident HPCs or OCs differentiate into both hepatocytes and biliary epithelial cells. NPE cells are another important resident multipotent progenitor cell population of the adult liver that can differentiate toward hepatocyte-like cells. If the liver exposed to retrorsine prior to partial hepatectomy, liver mass is restored by the emergence and expansion of SHPCs. In addition, BM-derived stem cells (BM-SC) may represent a potential important source of hepatocytes. Hepatocytes are highly differentiated cells with different synthetic and metabolic functions. In addition to this, hepatocytes are the cells that normally carry the burden of regenerative growth after liver damage, so they are considered as the functional stem cells under most circumstances. In health, with individual life expectancy of over a year, hepatocytes are the only source of minimal ‘wear-and-tear’ renewal. The regenerative capacity of the liver is particularly demonstrated when two thirds of the rat liver is resected by partial hepatectomy (PH), because the remaining part can re-grow to the original liver mass in about 10 days. This model has been deeply studied and has provided many data on the mechanisms involved in liver regeneration. In response to such stimulus, all the normally quiescent hepatocytes leave G0 phase to enter the cell cycle under the influence of various growth factors. Hepatocyte proliferation is initiated in the periportal region of the liver and then spreads to the centrilobular region. This regenerative response requires each hepatocyte to undergo 1.4 rounds of replication on average, to restore normal liver size. Thus this means that hepatocytes have non limited replication potential. Hepatocyte transplantation trials in mice have shown that hepatocytes are capable of large-scale clonal expansion within a diseased liver. Age has major influence on the response, as only in young rats (2 – 3 months old) do all hepatocytes enter the cell cycle at least once after a two-thirds PH, but in older rats (>2 years old) a significant number of hepatocytes do not respond and thus appear to have reproduction senescence. After a two-thirds PH there is a latent period of about 15 h before the first periportal hepatocytes enter DNA synthesis, and the peak of the response is reached at 24 h, the hepatocyte DNA labeling index reaches 40%. After 4 days this hyperplastic response is effectively suspended and further increases in liver mass are achieved through hepatocyte hypertrophy. To retain correct cellular relationships, the non-parenchymal cells proliferate as well, although their kinetics of cell cycle entry lags a few hours behind that of hepatocytes. Numerous growth factors and cytokines have been implicated in initiation and control of this regenerative response with the activation of various transcription factors, such as AP-1, NFκB and STAT-3. To determine the actual regenerative potential of re-populating hepatocytes, Overturf and his colleagues performed serial transplantation of a limited number of unfractionated adult parenchymal hepatocytes into FAH (fumarylacetoacetate hydrolase)- deficient mice (a model of the metabolic liver disease tyrosinaemia type I). The results shows that hepatocytes could divide without loss of function at least 69 times. Laconi and his colleagues blocked the proliferative potential of liver resident hepatocytes by using the pyrrolizidine alkaloid ,retrorsine, after PH and then transplanted young adult DPPIV (dipeptidyl peptidase IV)+ F344 cells into DPPIV− F344 rats. They detected that in female rats 40 to 60% of hepatic mass was replaced within 1 year. Near-total replacement of hepatocyte mass was completed in male rats (98 to 99%) and lasted for 9 months after transplantation. The liver has stem cells or HPCs that can be activated by persistent chronic liver[13,14]. The HPCs are the bipotent cells that can fully differentiate into hepatocytes and biliary epithilial cells. Recent studies have shown that HPCs are present in the smallest and most peripheral branches of the biliary tree, the ductules and canals of Hering. In rodents, adult HPCs are known as oval cells (OCs). The term ‘oval cells’ was first expressed by Farber, (1956) who found these cells with a characteristic morphological appearance after treatment of rats with carcinogenic agents, ethionine, 2-acetylaminofluorine and 3-methyl-4-dimethyl aminobenzene. These cells were described as ‘small oval shaped cells with scant lightly basophilic cytoplasm and pale blue-staining nuclei. Alison and his colleagues have shown that OCs is shown as a rich population of small round cells spreading from the periportal area and invading the parenchyma. Other studies have also demonstrated that OCs are capable of generating either hepatocytes or biliary epithelial cells when hepatocytes are unable to mount a proliferative response to injury[18,19]. The adult liver contains the multipotential NPE (non-parenchymal epithelial progenitor) cells. In a recently published study by Duret and his colleagues, NPE cells were isolated from human liver tissue samples, located at a distance from the lesion, and cultured and characterized. These cells expressed a markedly proliferative potential. They did not express the classic set of stem/progenitor cell markers [Oct-4, Rex-1, AFP (α-fetoprotein), CD90, c-kit, and CD34] and were expressing albumin at low level. When cultured at confluence in the presence of growth factors, example: HGF (hepatocyte growth factor) and either EGF (epidermal growth factor) or FGF4 (fibroblast growth factor 4), they entered a differentiation process toward hepatocytes. Their phenotypes were compared with that of mature human hepatocytes in primary culture. Differentiated NPE cells expressed albumin, α1- antitrypsin, fibrinogen, hepatobiliary markers, such as cytokeratins 7, 8 and 19, liver-enriched transcription factors and genes characterized by either a fetal or a mature expression pattern. 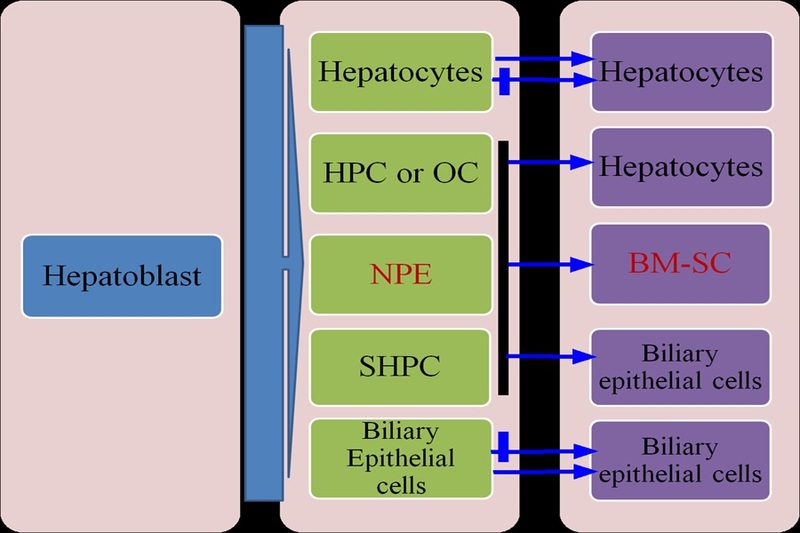 In addition, NPE cells could be isolated from the liver of different patients, irrespective of the absence or presence of lesions and differentiated toward hepatocyte-like cells with an intermediate hepatobiliary and mature/immature phenotype. These cells are likely to represent a resident progenitor cell population of the adult human liver. Dan and his associates have isolated a human fetal liver multipotent progenitor cell population that does not express liver-specific genes, but it is able to differentiate into functional hepatocytes and biliary epithelial cells. Moreover, these cells retain the multipotent potential to differentiate into fat, cartilage, bone and endothelial cells, and have a repopulation capacity in a liver injury mouse model. Another regenerative cell for liver injury is the SHPC (small hepatocyte-like progenitor cell). SHPCs share common phenotypes with hepatocytes, fetal hepatoblasts and OCs, but are phenotypically different. They express markers, such as albumin and its immature form, AFP, and possess bile canaliculi and store glycogen. If rats are exposed to retrorsine before PH, regeneration cannot occur from differentiated hepatocytes and the liver mass is restored by the induction and expansion of SHPCs. The origin of SHPCs is under debate. They may arise from a hepatocyte subpopulation that lack the required CYP (cytochrome P450) enzyme for retrorsine metabolism and therefore escape its mito-inhibitory effects. The results by Best and Coleman, (2007) provide direct proof that SHPC-mediated liver regeneration does not need OC activation or proliferation, and the SHPCs are not the progeny of OCs, but represent a distinct other population of liver progenitor cells . The combined evidence of these studies reveals that the liver has enormous replicative capacity in response to injury. It has adapted itself to the inflow of ingested toxins by the evolutionary development of unique regenerative properties and responds to tissue loss by the rapid division of mature cells. Proliferation of the parenchymal cells, i.e. hepatocytes and epithelial cells of the bile duct, and non parenchymal cells is involved in this cellular response. Resident hepatic stem/progenitor cells have also been identified in small numbers in normal liver and involved in liver tissue repair. Their potent role in the physiology, patho-physiology and therapy of the liver, however, is not yet precisely identified. Experimental analysis of the therapeutic value of these cells has been initiated but not fully understood. Cell based regenerative strategies aiming to replace, repair or enhance the biological function of damaged tissues or organs by utilizing their cells and bioactive molecules presents hope for patients especially in presence of transplantation problems and donors shortage. This review received no specific grant from any funding agency in the public, commercial, or not for profit sectors. We thank Egyptian Liver Research Institute and Hospital (ELRIAH), Mansoura, Egypt; Anatomy and Embryology Department, University of Mansoura, Egypt, for the extended support and scientific help. List of abbreviations: AFP: α-fetoprotein; CYP: Cytochrome P450; DPPIV: Dipeptidyl peptidase; EGF: Epidermal growth factor; FAH: Fumarylacetoacetate hydrolase; FGF4: Fibroblast growth factor 4; HGF: Hepatocyte growth factor; HPC: Hepatic progenitor cells; NFκB: Nuclear Factor Kappa B; NPE: Non-parenchymal epithelial progenitor; OC: oval cells; PH: Partial Hepatectomy; SHPC: Small hepatocyte-like progenitor cell. 1. Chung, H., Kim, K.H., Kim, J.G., et al. Retinal complications in patients with solid organ or bone marrow transplantations. (2007) Transplantation 83(6): 694-699. 2. Francoz, C., Belghiti, J. Durand, F. Indications of liver transplantation in patients with complications of cirrhosis. (2007) Best Practice & Research Clinical Gastroenterology 21(1):175-190. 3. Cheng, T. Toward ‘SMART’ stem cells. (2008) Gene Ther 15(2): 67-73. 4. Taub, R. Liver regeneration: from myth to mechanism. (2004) Nat Rev Mol Cell Biol 5(10): 836-847. 5. Alison, M.R., Vig, P., Russo, F., et al. Hepatic stem cells: from inside and outside the liver? (2004) Cell Prolif 37(1): 1-21. 6. Lagasse, E., Connors, H., Al-Dhalimy, M., et al. Purified hematopoietic stem cells can differentiate into hepatocytes in vivo. (2000) Nat Med 6(11): 1229-1234. 7. Faris, R.A., Konkin, T. Halpert, G. Liver stem cells: a potential source of hepatocytes for the treatment of human liver disease. (2001) Artif Organs 25(7): 513-521. 8. Stöcker, E. Heine, W.D. Regeneration of liver parenchyma under normal and pathological conditions. (1971) Beitr Pathol 144(4): 400-408. 9. Fabrikant, J.I. The kinetics of cellular proliferation in regenerating liver. (1968) J Cell Biol 36(3): 551. 11. Overturf, K., Al-Dhalimy, M., Ou, C.N., et al. Serial transplantation reveals the stem-cell-like regenerative potential of adult mouse hepatocytes. (1997) Am J Pathol 151(5): 1273. 12. Laconi, E., Oren, R., Mukhopadhyay, D.K., et al. Long-term, near-total liver replacement by transplantation of isolated hepatocytes in rats treated with retrorsine. (1998) Am J Pathol 153(1): 319-329. 13. Suzuki, A., Zheng, Y.W., Kaneko, S., et al. Clonal identification and characterization of self-renewing pluripotent stem cells in the developing liver. (2002) J Cell Biol 156(1): 173-184. 14. Lowes, K.N., Croager, E.J., Olynyk, J.K., et al. Oval cell?mediated liver regeneration: Role of cytokines and growth factors. (2003) J Gastroenterol Hepatol 18(1): 4-12. 15. Thorgeirsson, S.S. Hepatic stem cells in liver regeneration. (1996) FASEB J 10(11): 1249-1256. 16. Roskams, T.A., Theise, N.D., Balabaud, C., et al. Nomenclature of the finer branches of the biliary tree: canals, ductules, and ductular reactions in human livers. (2004) Hepatology 39(6): 1739-1745. 17. Farber, E. Similarities in the Sequence of Early Histological Changes Induced in the Liver of the Rat by Ethionine, 2-Acetylamino-fluorene, and 3′-Methyl-4- dimethylaminoazobenzene. (1956) Cancer Res 16(2): 142. 18. Evarts, R.P., Hu, Z., Omori, N., et al. Precursor-product relationship between oval cells and hepatocytes: comparison between tritiated thymidine and bromodeoxyuridine as tracers. (1996) Carcinogenesis 17(10): 2143-2151. 19. Lázaro, C.A., Rhim, J.A., Yamada, Y., et al. Generation of hepatocytes from oval cell precursors in culture. (1998) Cancer Res 58 (23): 5514-5522. 20. Duret, C., Gerbal?Chaloin, S., Ramos, J., et al. Isolation, characterization, and differentiation to hepatocyte?like cells of nonparenchymal epithelial cells from adult human liver. (2007) Stem Cells 25(7): 1779-1790. 21. Dan, Y.Y., Riehle, K.J., Lazaro, C., et al. Isolation of multipotent progenitor cells from human fetal liver capable of differentiating into liver and mesenchymal lineages. (2006) Proc Natl Acad Sci U S A 103(26): 9912-9917. 22. Gordon, G.J., Coleman, W.B., Grisham, J.W. Temporal analysis of hepatocyte differentiation by small hepatocyte-like progenitor cells during liver regeneration in retrorsine-exposed rats. (2000) Am J Pathol 157(3): 771-786. 23. Best, D.H., Coleman, W.B. Bile duct destruction by 4, 4′-diaminodiphenylmethane does not block the small hepatocyte-like progenitor cell response in retrorsine-exposed rats. (2007) Hepatology 46(5): 1611-1619.